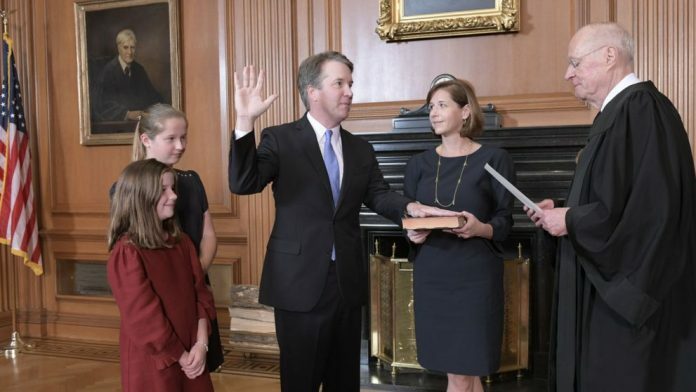 Brett Kavanaugh was already a Senate-confirmed, sworn-in Supreme Court associate justice on Monday night. Nevertheless, President Trump held a ceremonial swearing-in ceremony for him at the White House, as the president continues to revel in the successful confirmation of his second Supreme Court nominee in less than two years. Trump briefly addressed the crowd in the East Room of the White House, and began by apologizing to Kavanaugh and his family, who joined him on the stage. “On behalf of our nation, I want to apologize to Brett and the entire Kavanaugh family for the terrible pain and suffering you have been forced to endure,” Mr. Trump said. In his remarks, Kavanaugh said that he held “no bitterness” over the brutal Senate confirmation fight, during which he was accused of assault by three women and railed against Democrats opposed to his nomination.